Sewing machine plays an important role in garments manufacturing industry. There are a lot of sewing machines used in ready-made garments sector. This article has shown all the parts of a sewing machine and function of those. The main function of spool pin is to hold the spool of thread. During winding, bobbin is placed here. When bobbin reaches its optimum capacity then bobbin winder stopper stops the bobbin winding. The main object of stitch width dial is to control the zigzag stitch. Pattern selector dial is to set the symbol of the desired stitch pattern. Hand wheel is used to raise and lower the need, which is situated in the right side of the sewing machine. Stitch length dial is used to control the length of the stitch. The machine will sew in the reverse while the lever is pushed. Power switch means the off-on office of the sewing machine. Normally power switch is located at the right side of the machine. These types of thread guide are used during bobbin winding. Thread tension dial is used to control the tension on the top thread. During sewing the top thread passes through the thread take-up lever. Thread take-up lever moves up and down with the needle. Needle clamp screw holds the needle in its actual place. Presser foot holds the fabric in its definite place. During sewing bobbin cover protects and covers the bobbin holder. This type of button is used to release the cover for entrance to the bobbin. During sewing, feed dog pulls the fabric in forward. Needle is used to form a stitch in the garments. Needle plate is a metal plate which is situated under the needle and presser foot. It helps to move the fabric forward during sewing. Plz let me know…. 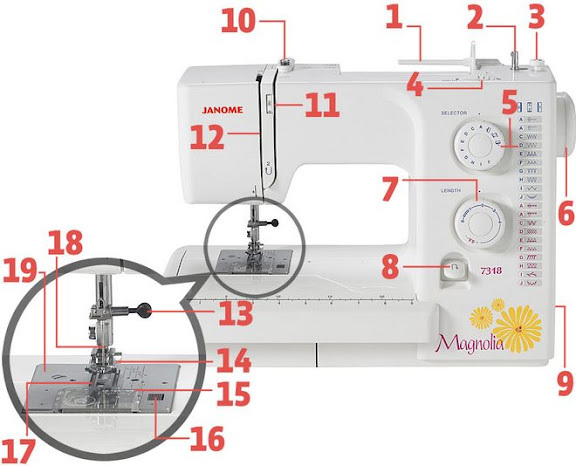 How a stich complete…..
what is the lower part of the sewing machine? and what it is function?